October. 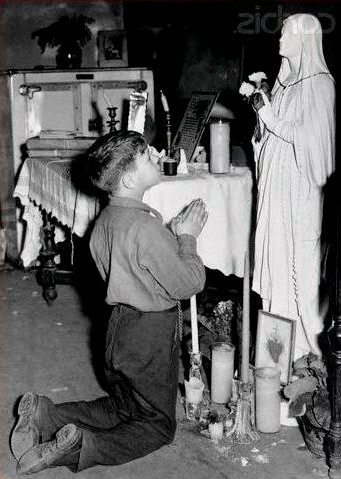 29, 1945 at age 9 Joseph Vitolo witnessed the Virgin Mary hovering over a spot where a shrine is now. The story is know as the Bronx Miracle. School teacher returns to classroom 5 years after brain tumor surgery - In article mentions an out-of-body experience as she watched nurses and doctors working on her body. In article purple heart recipient mentions seeing a bright light - and his life flashing before his eyes. "I saw a bright light and my life flashed right before me ... it was like shuffling a deck of cards"
Ohio native shares story of near-death experience - In interview mentions seeing the scene of being loaded in the ambulance from above. Seeing a white figure that seemed to be bigger than the others. Also given a cup of "life". “I saw Jesus,” Oklahoma man recalls near-death electrical accident - Right before I came to, I saw Jesus - standing there. He didn't have his arms out wide like this, he kind of just had them right here and he was looking at me. He was just looking at me." Woman with stage 4 liver disease, talks about her near death experience. "That every single action or decision that I make in this lifetime, I have to account for. Every single one, no matter how small or how large matters greatly". And that nothing, absolutely nothing, matters more than love. Heart attack survivor: ‘I don’t know why God spared me’ I’m not so concerned about the reason because I know heaven is real. If He wanted me here, there is a reason.” She paused, looked back at that world globe, then added: “We come here to die. We are here for just a season, or two or three or four. It’s going to end. What difference have you made in somebody else’s life? Trauma survivors honored as they reunite with medical teams who saved their lives. In article mentions Ohio man Kenneth Coleman who was brought back to life. He talks about seeing heaven. Defying the odds: Woman struck by lightning walking, talking. In article mentions that she had an out-of-body experience during the minutes after she was struck by lightning. Also remembers being with deceased Aunt that was holding her while she was in a coma. Trauma doctor: I saw spirit of crash victim's deceased wife in the O.R. Former emergency physician speaks to medical students about surreal experiences. Hilary Williams recalls near-death experience. During horrific accident remembers leaving her body, looking at the event from above, going to heaven and seeing deceased relatives. Michelle Crawford at age 10 while in severe heart failure, had a encounter with Jesus Christ and his disciples. I remember I couldn’t wake up and I had drifted off. I met someone, who I believe was Jesus. And He was coming for me. It was a wonderful setting. It was on a beach and it was night-time. Everything was black and the only light was the Moon. And Jesus arrived on his boat with his disciples. MN doctor mentions being wounded as a soldier and having an out-of-body experience. Perham man who nearly died in Vietnam learns firsthand about sacrifices. A part of Bill Rose is looking forward to the next life having caught a glimpse of it in 1968. I Went to Heaven: Las Vegas Shooting Victim Describes Out of Body Experience during emotional reunion with hero who saved her. Melanson said she had an out-of-body experience. My body just rose up, and I could see my body laying on the ground, and I went to heaven. Jesus Christ has been physically appearing to me for many years – Reverend Sister claims. - As Christians all over the world celebrate Easter, a nun, Reverend Sister Emmanuel, has revealed her encounters with Jesus Christ. Sperryville woman sees ‘the light’ after her heart stops beating. - “I went from being there [in the hospital] to this beautiful little place. And then further along there was this other brighter light” that Kevis described as extremely white. Oklahoma woman recounts heavenly encounter after horrific car wreck. - She flat-lined. “I saw a gold chair off to the right. Big round light in it. I can't describe anything in the chair, just the big light. And Kody came walking up. Godwin student paralyzed in crash: ‘Heaven is real. I’m here for a reason’. - He said, “I remember my uncle, I saw him in like heaven, and he told me that I’m going to get through the surgery and everything is going to be alright. Kelowna single mom is thankful to have a second chance to raise her teenage son. - Maureen died and came back to life.There are no words to describe what I went though, just that it was awfully pretty and beautiful. Dallas officer describes spiritual brush with afterlife. - Ed Lujan was moments from dying. He was run over by a SUV three times. He knew he was dying. I felt the euphoria of my life and soul leaving my body. He then saw his deceased Dad and God. His Dad spoke to him. Pender woman survives cancer, heart failure - She doesn't fear the end after a series of near-death experiences. She said she once went to a room filled with everyone whose lives she had touched. Woman survives ectopic miscarriage after an encounter with Christ - When she was left alone in a room without any medication, she then saw the biggest light emanating from this really tall being. Texas teen says he saw Jesus before being revived - Texas high school football player Zack Clements claims he met Jesus, who told him 'everything would be alright' after he collapsed in gym class and had no pulse for 20 minutes. Barber Joe Battaglia saw The Virgin Mary - Battaglia described the vision as a glowing figure outside his window, looking like a brilliant white christmas tree. The barber then went outside and the figure began to take shape, he says, ultimately coming into focus as the blessed mother. He said Mary told him don't be afraid, my dear, I have a mission for you. According to Franczyk So he built this incredible shrine. A California heart transplant recipient mentions seeing gates of Heaven - after waking from his coma seeing Heaven, Angels, family members, friends and past co-workers who have died...Then all of a sudden they said I wasn't ready to come and join them, he said. Then it faded out. Florida Mother survives 45 minutes with no pulse, remembers seeing a spiritual being - who she believed was her dad. I remember the light behind him and many other spiritual beings. 2 year old girl with heart defect had visions of Jesus - Hey Jesus. Hi. Hi Jesus, she said, to her moms surprise. What do you see, babe? Tamrah asked.Hi Jesus. Hi, little Giselle continued, her eyes wide with delight. Where is He? Right there, she pointed. Jim Caviezel talks about his suffering making The Passion of the Christ - He mentions being close to death. His shoulder dislocated, lungs full of fluid, struck by lighting and remembers being out of his body and looking at it. Pronounced dead, Mission Texas woman spontaneously revives, talks about her Near death experience. - Remembers going to Heaven, seeing Dad and Mom who passed away years ago. They just looked at me and I could feel so much love. Also recalls seeing her body from above lying in the hospital bed. In 1988, Steve Fanning died. Yet, he is alive to tell his story - During a coma he had a near death experience. Fanning experienced a life review seeing his life events not only through his own eyes, but through the eyes of another person and someone he describes as a higher being, with all three perspectives unfolding at the same time...He frequently thinks about his brush with death, it is a constant reminder to be kinder and more understanding. The Virgin Mary appeared to me - While waking from a coma Camilo Gomez Avila saw the Virgin Mary in his hospital room. I woke up from the induced coma, and I was drowsy and looking to around, when I saw something high approaching me. I realized that it was the Virgin Mary, she landed on my right side, stroked me his head, turned her hand and touched my face without saying anything, then went. Vision inspires church garden - during a 3 day coma Scott Steele has a vision of a garden that was indescribable, unlike anything I had ever seen on earth. Ron Polk talks about his near-death experience - he remembers being detached from his body — at the corner of the surgical table. Next thing I know, Polk says, I was in the most beautiful place I had ever seen. It was all light. And music. Music coming from everything, even coming out of me. And — you can not even imagine, it is so hard to explain — it was such peace. His wife was there. His father, too. And I just wanted to go to them, but I could not Polk says. Instead, he was pushed forward into an ever more brilliant light. Two Georgians who believe they've died, and yet lived. - Kathleen Hall and Tommy Thomason both believe they've had a brush with death. For Kathleen after being hit by a car remembers an immediate sense of autonomy and wholeness and completeness -- love. Tommy said his near-death experience led him to see and communicate with his late grandfather. And then this figure looked up and it was my grandfather.His Papa Jim had been dead for four years. And he looked up and smiled at me. Near-death experiences can occur at any age and have lasting effects. - I was 10 years old and was hit by a car when I had mine. Suzanne Wool remembers seeing white light through what seemed like a cone, which seemed to be pulling her. In her physically broken state, she interpreted her accompanying visions of angels and family to mean that God wanted her to let people know they should not fear death. Near-death experience gave woman lasting peace - “They knew I was in big trouble,” she said. “The whole time this was happening, I felt like I was suspended and floating in the corner of the room. And I remember thinking: ‘I want to let them know I’m OK – what are you so worried about?’” Bennett said she could see herself, from above, as the chaotic scene played out below on the bed of her parents’ Durham home. Bob Woodruff describes recovery - remembers after being caught in a bomb explosion, floating in the air and looking down on his injured body. 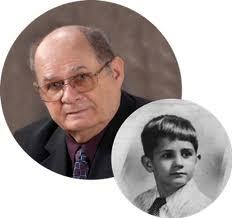 James Wilburn Chauncey - (talks about his near-death experience at age 7). Seeing Angels, heaven and looking at The Face of Jesus. James describes one of the angels Her skin was glowing with a hue that can only be described as a burnt golden color. Her hair was black as coal. Her voice was soothing and musical. She told me to not be afraid. When I asked her who she was, she said her name was Mary. Brush with death prompts Volusia man to share heavenly experience. - I've never experienced something as real as my time walking the streets of heaven. It was so vivid, so bold, so full of life - peaceful, tranquil, perfect. 3 year old says she saw Jesus after nearly drowning in pool - She said she drowned. She saw a bright light and a man walking to her with long hair. My sister showed her a picture on her phone and asked who it was ... it was a pic of Jesus. Ella said that was the man that saved her and she's never heard a bright light story before. Effort began following near death experience and vision - The day after I got out of the hospital from a near death experience, I had a vision that I was to start a restoration facility for victims of human trafficking. “I was in my hot tub. Sentences started downloading in my head and it was a trip,” Brown stated. “’You will facilitate the opening of a safe house for victims of human trafficking in Contra Costa County’ were the first, exact words. The sentences continued. ‘Many people will come to help you’ and then ‘Many people will come to know Me through this’. Living with death a brush with the afterlife - In 2006 Norman died of a heart attack while doing landscaping work. He flatlined and had no heartbeat for an incredible 15 minutes. During that time he remembers floating up into the air and meeting a man eight or nine feet tall who guided him. All the while he felt at peace and wasn't scared. During heart attack Wisconsin man talks to deceased Father and Jesus who gives him a message for all people - during his near-death experience..."that they are truly loved, and that there is a man named Jesus. And assure them all that there is a special place for them. Living on earth is just temporary and heaven is everlasting. Woman who was cured of a brain aneurysm in miracle - that secured Pope John II a sainthood tells how she heard a voice whisper be not afraid moments before' Pope John Paul II has finally approved for Sainthood thanks to a Costa Rican woman who claims the late Pope cured her brain aneurysm. Houston cyclist recounts near-death experience - Scott was resuscitated several times by paramedics. During that crisis he talks about his near-death experience, “My dad joined me at the playground, and we sat and talked about my daughter, ”. Giving Birth, Woman Experiences Death - 6 months into Nancy's pregnancy complications arose. Nancy remembers leaving her body during surgery, being surrounded with wonderful light and being with a group of people thinking about joining them or going back. San Antonio woman saw parents in near-death experience - Linda Fair believes she knows what happens after you die. "I died and it was amazing. I got to see my mom, my dad (who had died) and my husband's dad that had been dead for like 35 years!". A Doctor's Near Death Experience Inspires a New Life - As the minutes ticked by in the ER., Dr. Magrisso says he was in a place with no time. He remembers three illuminated figures he later identified as his father, a close friend and a young man, a sort of welcoming crew. All three had died less than four years earlier. A miracle - So close to death, Hugh Suggs battles back - he remembers being in the medical helicopter and having what he described as an out-of-body experience, his detached soul looking down at his mangled body. He says when a voice asked him if he wanted to live, he answered yes. Lightning strike survivor feels lucky to be alive. "Your life really does flash before your eyes - "I saw everything I did in my life - good and bad. It might have been only 30 seconds, but flashbulb images of his life ran through his mind - his wedding day, the births of his children and even mischievous antics from his youth. Las Crucen experiences miracle recovery - Joseph Gaytan IV counts himself blessed to be back among the living. While riding his bike early one morning was struck by a car. Upon emerging from the coma, reported having visited both hell and heaven. He was given a message from God, telling him to turn his life around and beginning helping people. Red Sox right fielder Josh Reddick's father, Kenny Reddick's near-death experience - I actually knew what was going on,he said. I looked up to the blue skies and said, 'What if this is it?' Kenny died for approximately two minutes. He said he saw the white light three times and had out-of-body experiences, watching on as CPR was performed on him. Life after life? This Wyoming surgeon says she believes - Her "accident" included death by drowning, an all-too-brief visit with spiritual beings in the life after death, and a remarkable resuscitation after 14 minutes under water. Although she could not identify these souls by name, she felt that she knew them well, "and knew that I had known them for an eternity." Dover man grateful for paramedics - while he was under Bollacker had a near-death experience.. remembers being in a dark hallway, on the left was a doorway, and a bright light was coming out from underneath the door. As he reached for the doorknob and was turning it, he heard a voice on the other side, as clear as a bell, say Pop, it is not your time yet. Phenomena still said to occur in house of woman who endured wounds of Jesus - Caretaker for house of stigmatic says scent of roses and healings still occur. Schererville man believes slain daughter brought him back to life - Fred Hieber's daughter died from a gunshot wound in July. Fred suffered a heart attack while en route to the Illinois hospital where she had been admitted. He said he saw a vision of her while he was dying, and she told him to go back. He said he knew his daughter was dead before his wife told him days later. Fred recalls a sensation of walking down a dark tunnel and having a bright light move toward him. It was his daughter, Holly, who brought him back to life. Pennsylvania, commissioner James Scahill's Near Death Experience - Jim survived a sudden cardiac arrest (SCA) Sept. 21, 1999 and he was pronounced clinically and biologically dead for over 14 minutes. It took Jim a year before he felt comfortable talking about the out of body experience he had during his cardiac arrest. He found himself sitting on the edge of the Administration Building looking down on his body lying in the parking lot with many people around. After watching the resuscitation attempts, he heard a voice behind him say, "It's time for you to go down there." He felt two small hands push him off the building from where he re-entered his body. Albert Lea Police Chief Given Life Saving Award - I suddenly didn't feel any pain, I remember seeing them clearly, but later I found out, I was unconscious. Chris Palmer farm accident survivor talks about his near-death experience - He was amazed to find that he experienced something like the stories he'd heard about the light at the end of the tunnel at the moment of death. Jane Seymour Recalls Near-Death Experience - I literally left my body. I had this feeling that I could see myself on the bed, with people grouped around me. I remember them all trying to resuscitate me. I was above them, in the corner of the room looking down. I saw people putting needles in me, trying to hold me down, doing things. I remember my whole life flashing before my eyes, but I was not thinking about winning Emmys or anything like that. The only thing I cared about was that I wanted to live because I did not want anyone else looking after my children. Miranda Kerr: 'I thought I'd die during childbirth' - I actually thought I was going to die at one point and left my body,’ she revealed of baby Flynn’s difficult birth. 'I was looking down on myself - the pain was so intense. During a stroke Fran Samson remembered - being in a wonderful bright place and feeling so warm and just perfectly happy. Denver woman Pamela Esquibel sees the light, a near death experience opens her to new possibilities - That's when Esquibel saw the light. It was bright and white, enormous and embracing. "I remember feeling so small compared to this huge magnificent light," she said. "It was the best feeling, warm and cozy, like having someone hug you. It was such a contrast to the normal pain of living. Born fighter: Dan McInnis recounts near-death experience - Former Richmond County Sheriff’s Office Deputy Dan McInnis, after years of fighting for his life against a series of medical mishaps and chronic conditions, said his most recent trip to the hospital gave him a glimpse of the afterlife. Jenny Hinojos of Zullinger survives 3-pound brain tumor - I flatlined for eight minutes and had a total near-death experience. I told them what time they pronounced me dead, what music they were listening to, what they talked about and what kind of shoes my one surgeon was wearing. They confirmed all of that later. In article community warrior mentions dying and being comforted by family that had passed away - She could barely breathe and felt like her life was slipping away and I flatlined,'' she said. In that moment, she heard three voices from deceased family members. Darren Mooney talks about a horrific wreck and a visit by Angels - I would be the last person who you would think would see something like that. But I was there, I was awake, and it was real as me talking to you. The experience immediately changed Mooneyham — his attitude, his personality, his ambition. The message he takes is one of protection. So many times were not in control, he said.It is like were here, fighting for you. The message was, do not let your puny mind think we are not. While in coma Carissa sees deceased cousin - Carissa's only memory of that time is something she refers to as an extraordinary dreamlike experience.She said she remembers a big ornate gate and seeing a recently deceased cousin. That cousin, Carissa said, told her, "You can stay here with me or you can go back." But, she recounted, he told her if she goes back she'll end up blind. Ellis woman enjoying life after medical 'miracle'- remembers NDE during coma..."In my coma, I remember seeing a white light all the time. My dad was trying to get me to stay. He's in heaven..."
Dr. Lloyd Rudy, a pioneer of cardiac surgery - tells stories of two patients who came back to life after being declared dead, and what they told him. The Dr. OZ Show - Near Death Experiences: Are they real? - Laurelynn went for her surgery and her doctor punctured her abdominal aorta, she lost a massive amount of blood and was clinically dead. She said next she was up off the ceiling and looked down and saw her body. She saw a light on the horizon and what she wanted to do the most was go into the light it was a place of unconditional love. Before she got the light her deceased brother in law intercepted her from getting to the light. He took her on a journey and they talked and he told her she had to go back there was a mistake you have to go back to live your lifes purpose. Missionary Priest in Canada Claims to Suffer Christ's Full Passion and to Have Visions - "I feel in my body as though I am right there with Jesus, experiencing everything He's experiencing. Every Holy Week I experience the same thing. At times I scream from the pain. There is nobody physically beating me but I feel as if I am going through the whole scourging.